On March 11, 1943, the entire Jewish community of Monastir, in Yugoslav Macedonia, was rounded up and sent north to a transit camp at the Monopol Tobacco Warehouse, in Skopje. There, along with the Jews gathered from Skopje and Shtip, they were sent to the Treblinka Concentration Camp in three transports. Except for a few foreign nationals and physicians who were released, not one Monastirli Jew survived the aftermath of Treblinka. Jamila Kolonomos was one of a handful of Jews who escaped the deportations. As a member of the Yugoslav Underground, she was sent into hiding when the round-up occured, and with several Jewish companions, she was able to flee the city and join the Partisan army. 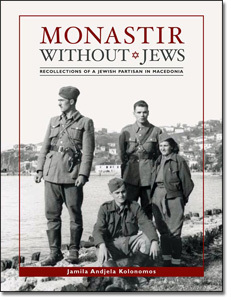 Monastir Without Jews is her personal memoir recalling the fate of Monastir’s Jewish Community during the Holocaust -- it is also an eyewitness account of the Jewish presence in the Yugoslav Resistance, as recalled by this highly decorated Jewish Partisan. Adapted from the compilation of Ladino (Judeo-Spanish) articles and essays, Monastir Sin Djudyos, and appearing for the first time in English, with the addition of 150 personal and archival photographs, Monastir Without Jews is a rare firsthand account of the life and death of a Sephardic community. Monastir Without Jews will be available beginning March 11, 2008. 160pp, paper. Maps, photos & illustrations. NOTE: Pre-orders will ship beginning March 11, 2008.